Are you planning on writing them as a professional ichthyologist? I hope to do so. You hope to do so? C'mon prez, get the lead out and sharpen that pencil! Well, I did write a personal letter, but if others are doing both, I'll also do so. I have been reaching out beyond the forum and received several nice endorsements. I have also sent an email to all the Tennessee NANFA members, most of which are not active on this forum. I continue to urge each of you to endorse this letter and send me you name, city and state and any fishy title, employment or degree. To those that have responded, thank you for stating your endorsement to potentially modify this regulation. I also urge you to pass this on to anyone "fishy" that you think would be interested. I plan on submitting a final review next Monday so i can get it in the mail by May 1 or 2... just a few days before the May 6 deadline for submissions regarding changes to the 2015 TWRA regulations. Make your voice heard. Will write an individual note as well as adding my name to your letter. Native Fish Enthusiasts were disappointed several years ago when TWRA enacted their new regulation regarding non-game fish, fish usually considered as trash or bait fish by most of the general public. This is not so with members of the North American Native Fishes Association. Formed in 1972, NANFA's mission statement has long been dedicated to the Appreciation, Study and Conservation of North America's Native Fish and is so stated in each issue of our excellent quarterly publication, American Currents. Our membership is comprised of people from all walks of life who admire, study and appreciate the continent's native fish, many of which are found in the most fish diverse state in the union, proudly Tennessee. We ask you to reconsider your regulation and allow fishing licensed citizens to collect and retain limited numbers of non-listed species. Live Bait Regulations, Section 3, Class C Bait Fish. Many of our smaller common minnows, dace and darters can exist and thrive in aquariums. Enthusiastic native aquarists in adjoining states can enjoy, learn, share and teach others about the importance and wonders of the life that exists in our nation's healthier waters. Most people know nothing of the incredible diversity that thrives below the surface of the waters we drink from. Oddly it is of frustration that species from around the entire world can be imported into Tennessee and be kept in home aquariums yet our native fish cannot be studied for knowledge nor pleasure. And with that in mind it is incomprehensible to our membership that a Redline Darter can be stuck through dead with a fishing hook and used as bait to catch a fat Bass yet no one is allowed to take home a tiny Tennessee Snubnose Darter to feed and observe. In the past NANFA members had enthusiastically visited and traveled throughout the state to observe, photograph and at times to collect a select few fish to study. Today an American citizen can no longer do so and many simply avoid our state choosing to visit other Southeastern states as allowed. Regulations such as Arkansas's allow the possession of a limited number of non-game fish, which is much more reasonable and conducive to some of our fellow citizen's interests. We understand and acknowledge the concerns expressed by TWRA but NANFA and its membership are missionaries to the general public supporting and offering programs, expressing wonders and concerns, funding annual financial grants and sharing knowledge with ichthyologists and state agencies. We are enthusiastic teachers foremost. NANFA members are well aware of never introducing any fish into any waters. Sadly this is not the case with the general public be it releasing foreign fish purchased from pet stores, flooded fish farms, bait shops and bucket releases. Collecting a few non-listed fish is of minimal, if not zero impact, on the diverse and often abundant populations of Tennessee's common native fish. On the other hand NANFA members are well aware of the major impact on our native fish, the siltation that results from continued development, erosion and unsound activities on the surrounding land. Collecting a few minnows or common darters is not an issue. Thus we urge TWRA to provide reasonable allowances for those interested in our Native Fishes. To collect a few individuals of non-listed, non-game fish and at the same time generate revenue for the state, increase public awareness, and help nurture Native Fish ambassadors in the effort to share and teach of the beauty that lives below the surface. And to speak for the youth of our country, our budding naturalists. Who among us has not kept a crawdaddy, toad, field mouse or preying mantis as a little boy or girl and learned to appreciate nature from this simple wonder? Michael Wolfe of Statham, GA. NANFA Board Chair & Secretary and Georgia Representative. Matt De La Vega of Pleasant Plain, OH. NANFA Board Member and South Ohio Representative. Brian Zimmerman of Gambier, OH. NANFA Board Member and Vice President. Joshua Blaylock of Richmond, KY. NANFA Board Member and Kentucky Representative. Fritz Rohde of Wilmington, NC. NANFA Board of Directors, President and National Marine Fisheries Service. Dustin Smith of Lexington, SC. SC Representative and Past NANFA BoD Member. Casper Cox of Chattanooga, TN. Tennessee Representative & Snorkeling Guide for the Cherokee National Forest. Ben Cantrell of Peoria, IL. Illinois Representative. Gerald Pottern of Wake Forest, NC. NC Representative and Aquatic Biologist. Ken Glackin of Cedar Rapids, Iowa. Iowa Representative. Erica Lyons of Winston-Salem, NC. NANFA Member. John Nixon of East Norriton, PA. NANFA Member and Owner/Operator of Neptune's Gardener Aquarium Service, LLC. Stephen Beaman of Columbia, SC. NANFA Member. Jim Herrig of Cleveland, TN. NANFA Member. Ed Scott of Knoxville, TN. NANFA Member and Retired TVA Biologist. David A. Etnier of Knoxville, TN. Emeritus UT Professor of Zoology and longtime NANFA admirer and contributor. Michael Lucas of Schenectady, NY. Eastern New York Representative. Aaron McCaleb of Albion, IL. NANFA Member. Benjamin P. Keck, PhD of Knoxville, TN. Postdoctoral Associate, Dept. Ecology and Evolutionary Biology. Instructor, Division of Biology at University of Tennessee, Knoxville. Associate Editor, Southeastern Fishes Council Proceedings. Bryce Gibson of Knoxville, TN. NANFA Member, Underwater Photographer. Isaac Szabo, Marble Falls, AR. NANFA Member, Underwater Photographer. Uland Thomas of Chicago Heights, IL. NANFA Member. Derek Wheaton of Blacksburg, VA. Virginia Representative. Robert Nichols of Greenville, SC. NANFA Member. Capt. Carol Jackson of Travelers Rest, SC. Robert Giarla of Cleveland, TN. NANFA Member and Tennessee Tech Fisheries Student. John Duktig of Atlanta, GA. NANFA Member and Director, Research Animal Science. Konrad Schmidt of St. Paul, MN. American Currents co-editor, retired non-game fish biologist, contributing author to the Fishes of Minnesota, and NANFA Fellow. Matt Knepley of Ninety Six, SC. NANFA Member. Marcus Zokan of Athens, GA. NANFA Member, M.S. Marine Biology. Wayne C. Starnes , Ph.D. of Raleigh, NC. NANFA Member. Research Curator of Fishes, North Carolina Museum of Natural Sciences. Travis Haas of New Orleans, LA. NANFA Member. Ph.D. Candidate, Tulane University Dept. of Ecology and Evolutionary Biology. Faculty in Science, New Orleans Center for Creative Arts. Greg Ware of Watkinsville, GA. NANFA Member. Ray Katula of Onalaska, Wisconsin. Former NANFA president, NANFA Fellow and Founder, Fish Hatchery Manager. Robert E. Jenkins of Salem, VA. NANFA Member. Ichthyologist. Dan Huser of Chattanooga, TN. NANFA Member. Watershed Program Manager, Limestone Valley RC&D Council. M.S. in Environmental Science Aquatic Ecology. John Zardis of Tellico Plains, TN. NANFA Member. This is the letter i will soon print and send to TWRA. I reached out and acquired a few more signatures you may notice! If there are any additions or corrections let me know promptly. I asked for but did not receive any suggestions for improvements to the letter's contents so i presume all signees are content with it as written. I tried to keep it simple, to the point and with a few written illustrations. My goal is to put this letter in the mail May 1, 3 days from now. Looks like you forgot me! What ever happened to respecting your elders?? This morning i delivered to the local Post Office our NANFA letter to TWRA. It had 38 signatures attached and near all 7 of NANFA's BoD members, with the exception of Bob Muller and Tom Watson. I will also be sending an e-mail to TWRA on Monday, May 5th, the day before the deadline for public input. I have received 2 more names since i printed the letter last night and will add them to the e-mailing on Monday. Any others? 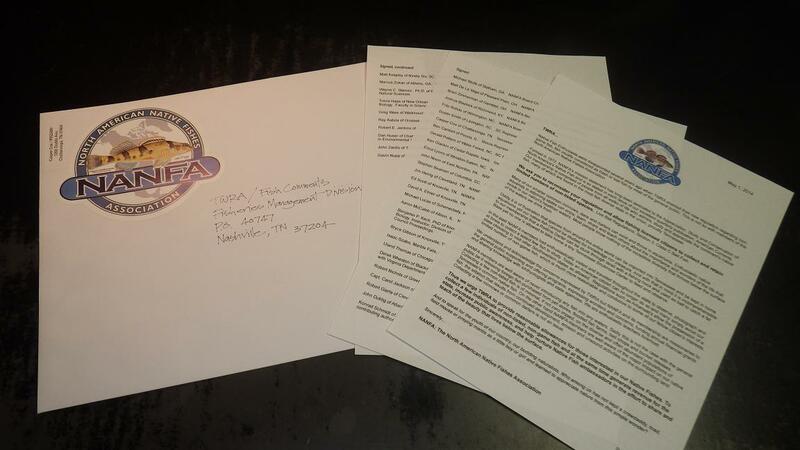 I reached out to all TN and GA NANFA members and several regional leaders in Ichthyology with some success. I want to think all the signers. Hopefully our action will help motivate TWRA to make adjustments to their regulations. NANFA members are well aware of the concerns about disease, releasing fish and listed species. This is something we teach, share and acknowledge. We are among the best ambassadors for North America's Native Fish. I still urge each of you to write your own letter and MAIL and E-MAIL it. The more voices expressed the better. I will handwrite a short letter today from my personal point of view. I thank all of you who have taken the time to study this. Thank you for taking the time to do this Casper. As always, your presentation is very well thought out and represents us well. If this doesn't make a difference with some of those names on their, notably the NANFA BOD members and Drs. Etnier, Starnes, Jenkins and Keck, among others, then I am not really sure what else we could do. And for what it's worth, here's a copy of the note I penned to TWRA. It's hardly an earth shaker, but the more responses the Volunteer State gets from us NANFA types the better. Consider it as an example, heck use it as a flat-out template, if you want to write something yourself but don't think you have "the words". Honestly, though, you do have the words, whether you think you do or not. Just put something down on paper and then stamp it or email it. Better yet, do both! I understand your agency is reconsidering Tennessee’s fishing regulations for 2015. As a near neighbor of your great state, and as an amateur ichthyologist, I am very appreciative of your willingness to consider comments from the public as they pertain to this topic. Tennessee is famous among native fish enthusiasts across the continent for its variety and abundance of piscine life. Although your current regulations would allow me to angle for many of these animals, they forbid me to pursue my favorite pastime, namely legally collecting nongame fish for home study and appreciation. While this is disappointing to me personally, it is of some loss to Tennessee as well. See, I travel all over my home state in legal pursuit of nongame fish. I enjoy the same privilege in Georgia, and am excited to do be doing so with a large group of like-minded individuals in North Carolina this summer. All these expeditions result in inputting monies into local economies. Native fish enthusiasts willingly spend money on permits, licenses, gas, food, lodging, taxes, and other odds and end in our pursuits. Tennessee has seen many such funds that would have been spent in the Volunteer State funneled to Kentucky, Georgia, and North Carolina instead. My own family of four plans a vacation to the Smoky Mountain region soon. Native fish regulations as they now stand will ensure that we do so on the NC side. In addition to well known, tourist-accustomed areas, we native fish fans often travel to, and spend money in, more remote, less affluent areas. While we may not make or break any individual economy, our patronage and gratuities are very welcome in some of these poorer regions. So consider the plea of this would-be visitor to your great state. Please reconfigure Tennessee’s laws concerning non-game fish to allow the responsible taking and possessing of nongame fishes. It would seem a wise course of action, adding resources to local economies, and ensuring a persistent, passionate following of some of your agency’s most underappreciated charges. There are many appreciated signers of the TWRA letter and i thank each of them. I forgot to mention my Cherokee National Forest Snorkle Boss Jim too. Prez Bruce, you never responded to the letter as presented. Do you wish me to add you to the e-mail letter? That would make 41. I know there are other readers to this posting too, some who have visited Tennessee in the past. Let your voice now be heard. I am Stunned. I know Matt is skilled with words and again he proves it. Wonderfully, passionatly, clearly, informed, illustratedly stated. I urge everyone to do so. I cannot state enough... the more letters and e-mails the better. Take Neely's guidance to heart, be respectful and clearly express your desires. I just finished my letter, i am going to review it later, maybe another edit. Hey... we all know how to communicate. Just do it. Ex Prez B. Stalledsmith of middle parts north 'bama. Redneck Yankee and NANFA rep. UA fishy guy and DNA dabbler. Not thinking redneck and Bruce are even in the same universe.